As a young reporter Russell reported on a brief military conflict between Prussian and Danish troops in Denmark in 1850. William Howard Russell CVO (28 March 1820 - 11 February 1907) he was born in Tallaght Co. 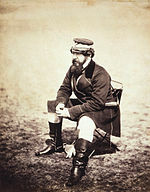 He was an Irish reporter with The Times and is considered to have been one of the first modern war correspondents after he spent 22 months covering the Crimean War including the Charge of the Light Brigade.